Patrick Buchanan: Will Donald Trump Be Swindled In Cleveland, Too? In the race for the Republican nomination, Donald Trump would seem to be in the catbird seat. He has won the most states, the most delegates and the most votes — by nearly two million. Over the weekend, Colorado awarded all 34 delegates to Ted Cruz. The fix had been in since August, when party officials, alarmed at Trump’s popularity, decided it would be best if Colorado Republicans were not allowed to vote on the party’s nominee. In state after state, when Trump wins, and moves on, the apparatchiks arrive — to thieve delegates for Cruz. “I watch Bernie, he wins. He wins. He keeps winning, winning,” said Trump in Rochester. “And then I see, he’s got no chance. They always say he’s got no chance. Why doesn’t he have a chance? Sanders seems to be shorted every time he wins a primary or caucus. And the insurmountable hurdle he faces was erected against folks like Sanders some time ago — the 700-plus superdelegates. The Democratic Party believes in democracy, up to a point — that point being that Democratic voters will not be permitted to nominate a candidate to whom the party elites object. Richard Nixon’s 49-state triumph in 1972 cured the Democrats of their naive belief in democracy. Henceforth, the George McGoverns and Bernie Sanderses can run. But they will not be allowed to win. 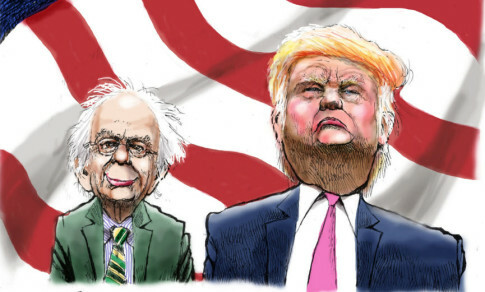 Yet, since it is Trump and Sanders who have stirred the greatest passion and brought out the biggest crowds, if both are seen as having been cheated by insiders, then the American political system may suffer a setback similar to that caused by the “corrupt bargain” of 1824. Andrew Jackson ran first in the popular vote and the Electoral College, but was short of victory. John Quincy Adams, who ran second, got Speaker Henry Clay to deliver the House of Representatives, and thus make Adams president. Clay became Adam’s secretary of state. If the “America First” stance on foreign and trade policy, close to a majority position today, is unrepresented by either party this fall, and we get a free trade, War Party president, the divisions within the country will widen and deepen.